Below is the process used for applicants desiring to become a volunteer firefighter with our district. Complete Driving Record Request and mail to address on form with payment or visit the DOL and request in person. Complete the Request for Conviction Criminal History Record. We will process this for you. Return completed application, the completed request for conviction criminal history record and your driving record to the district office. You will be contacted for an interview after we have received your driving record and processed you criminal history report. Please allow us up to 4 weeks to review your interview answers an make recommendations to the Chief Officers. If accepted you will be invited to join our weekly drill nights for four (4) weeks to see what we do and how we do it. At this time you will fill out a benefits packet. 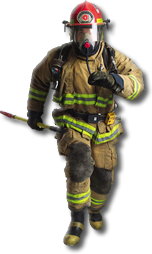 After four (4) drills in four (4) weeks, you will be eligible for benefits, receive gear and training materials and be eligible to ride along on calls. There will be performance reviews at six (6) and twelve (12) month intervals. Upon successful completion of twelve (12) consecutive months, member probation will be complete.